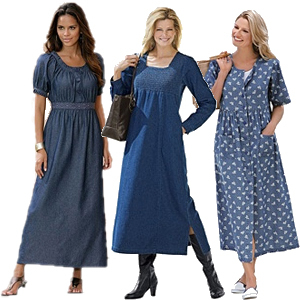 Plus Size Denim Dresses are always available - the abundance of selections depends on whether or not they are in style each season. There are some really cute dresses available for this spring and summer - they just aren't plentiful. Items pictured from Ashley Stewart and Roaman's. The styles we are seeing right now are either basic jumpers and sundresses or are inspired by this season's trends - boho chic, vintage inspired or all whites. A denim dress can be a real stable in your wardrobe - you can dress it up or down and wear it for many different occasions. They are wonderful for casual wear and can be so much more comfortable and look so much nicer than jeans, especially on plus sizes. I love them in the fall and winter months with boots and with cute sandals in the spring and summer. A great style will serve your wardrobe for many years to come. Some of the most favorite dresses I have ever had were denim dresses! 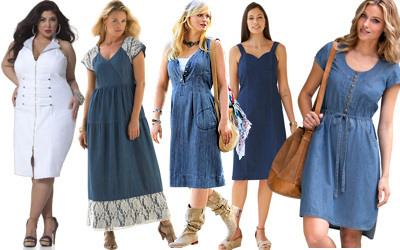 The selection of denim dresses available at any given time depends how "in" denim is at the moment. Currently it isn't as popular as it has been in the past - so the selection seems to be more limited. Denim Skirts and Long Denim Skirts are much more abundant than dresses - but I'm sure they'll be back one of these days!